Bianca Marcocci : Smells amazing - and very moisurising. 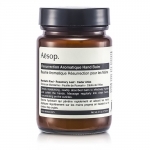 This is Aesop's most popular hand balm and it's not hard to see why. It smells great and is incredibly moisturizing - great for the dry winter months.